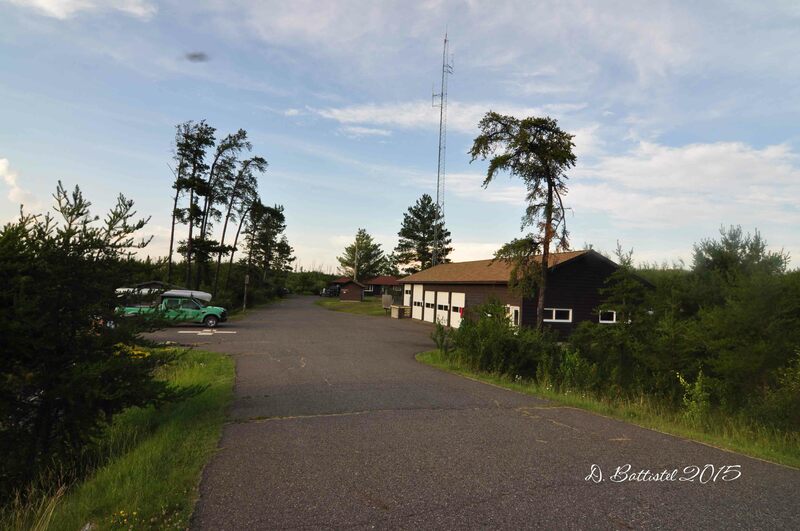 logging camp | Poverty, Agony, Distress & Want! I’ve been working on a railroad…and I got lost! 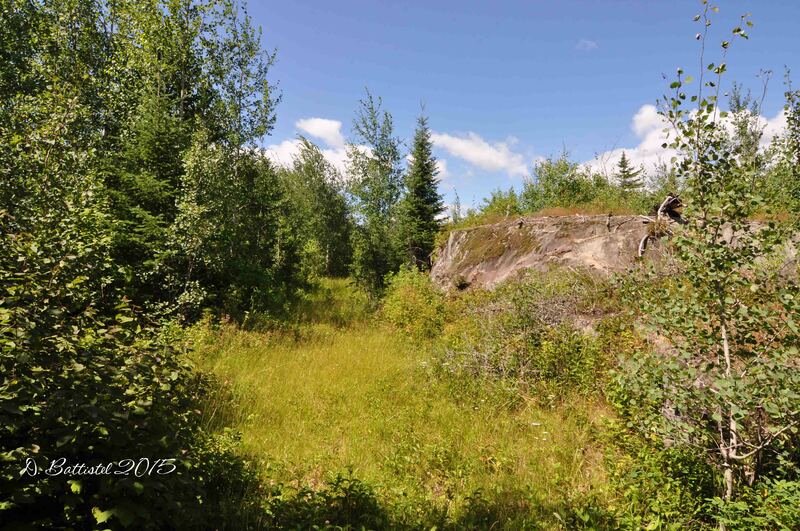 I was going to title this post “How to get lost in the bush and other exciting stuff…Part II” in honour of the last time I got lost hiking, but I thought this sounded better. If you read that post, I didn’t really get lost, I just went slightly astray. This time there was a bit more consternation though, as I was quite a distance from any civilization and I had been walking for a very long time. I do tend to go for long walks, don’t I? And I don’t really do any normal hiking either for that matter, which is probably why I get lost in the first place. I see a pattern emerging here…do you? So, we’ve arrived at the end of May kids; the year continues to fly by! It’s hard to believe that in a month school will be over. Craziness! Unfortunately, there is so much to do between now and then I can barely wrap my head around it. In fact, I don’t even really want to think about it either. It makes me depressed. The kids have already checked out, so it’s like pulling teeth to try to get them to do anything, and that makes me even more exhausted. I guess like every other year, this too shall pass. No blog post would ever be complete without me saying something about the weather. Talk about a dog’s breakfast! The temperatures and conditions have been all over the place, almost like the proverbial box of chocolates, you’ll never know what you get. As I write I’m sitting on my couch at camp watching a slight drizzle fall…it’s supposed to be mostly sunny and only a 25% chance of rain. Yesterday was gorgeous, one of the best days so far this spring. 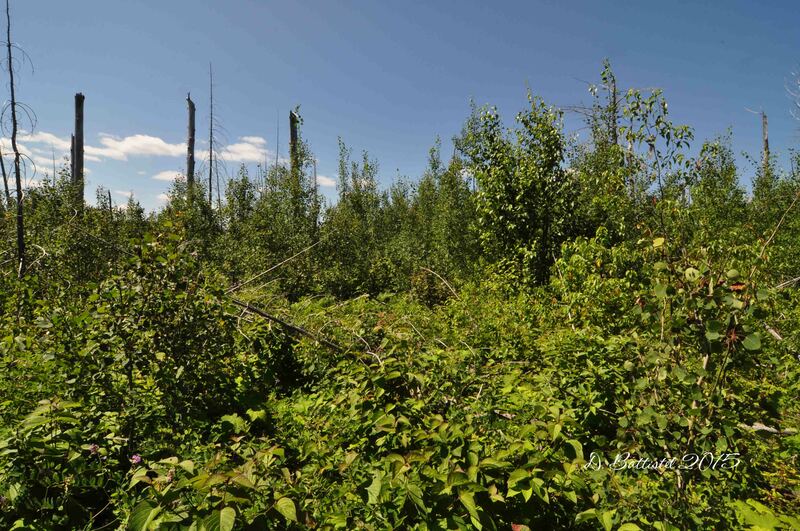 However, the blackflies were atrocious! Like I mean underneath your sunglasses, in your nose, in your ears, swallowing more than I’d care to atrocious. I have not seen them this bad in quite some time. I toughed it out most of the day, but it was not fun. The boys and I couldn’t even have a fire last night, as no one wanted to stay outside in that mess. It’s a good thing that I decided to go for my first railway hike of the year last weekend, because thankfully (or mercifully) there were no blackflies to found. I had a great time, though I may have pushed myself a little too hard, which I’ll explain later. 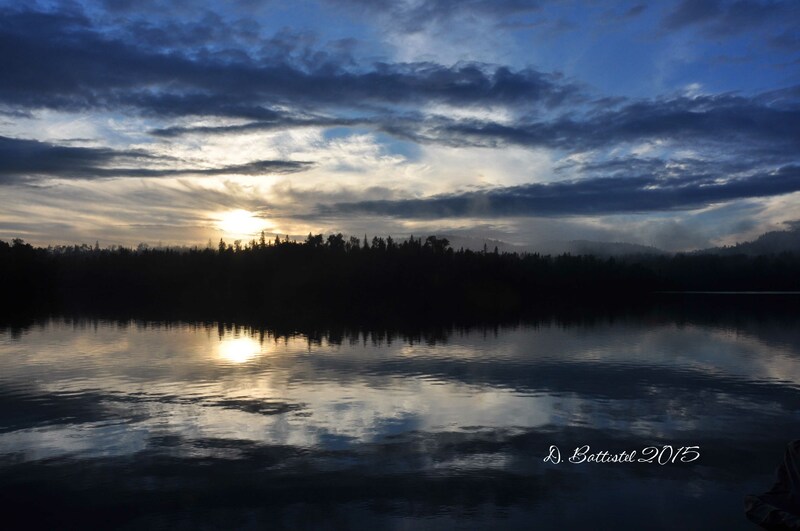 My plan was to continue following the grade of the Gunflint & Lake Superior eastward from Crab Lake, hopefully to its terminus, wherever that was. To accomplish this, I decided to spend a night with John and Rose at the Cross River Lodge, which would allow me to get an early start on the hike. It was a nice night and I got to spend some time chatting with the other guests. Rising fairly early, I started my hike around 0800 (Central time). 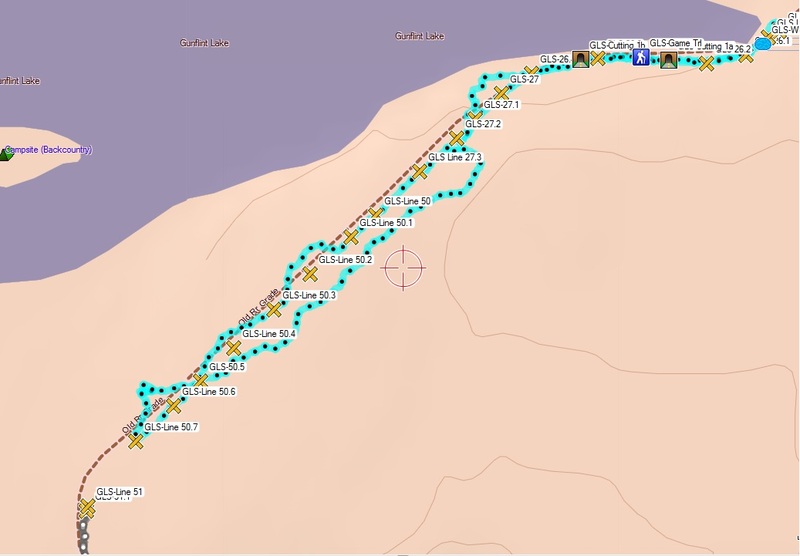 It was going to be a long one; it was nearly 3 kilometres to my starting point, a then I would have another 3 kilometres to my turn around point. By 0900 I had reached the western end of Whisker Lake, a short distance from where I had ended my hike the previous year and went over a part of a section I missed last time, making a big discovery. 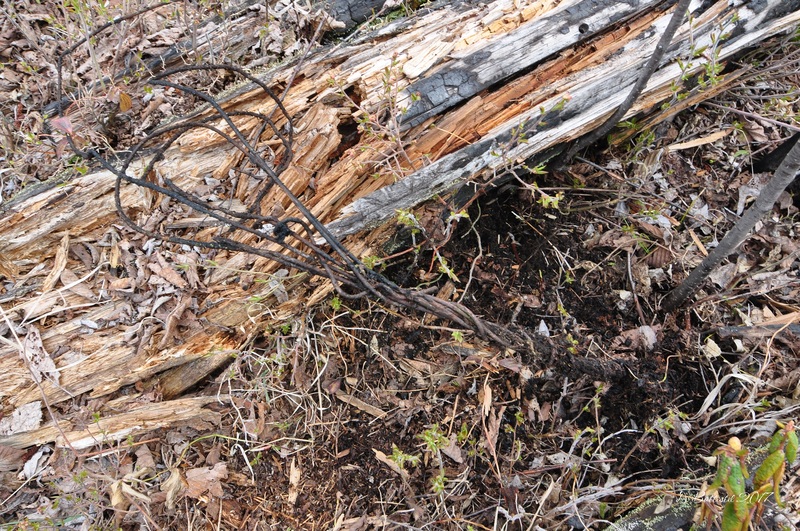 I had determined that a telegraph line had been run to Camp 4, but last year I found evidence that it may have gone further. At that west side of Whisker, I found another section of wire, but where did it go? After making my way to my previous end point, it was another 600 metres to the east end of the lake. 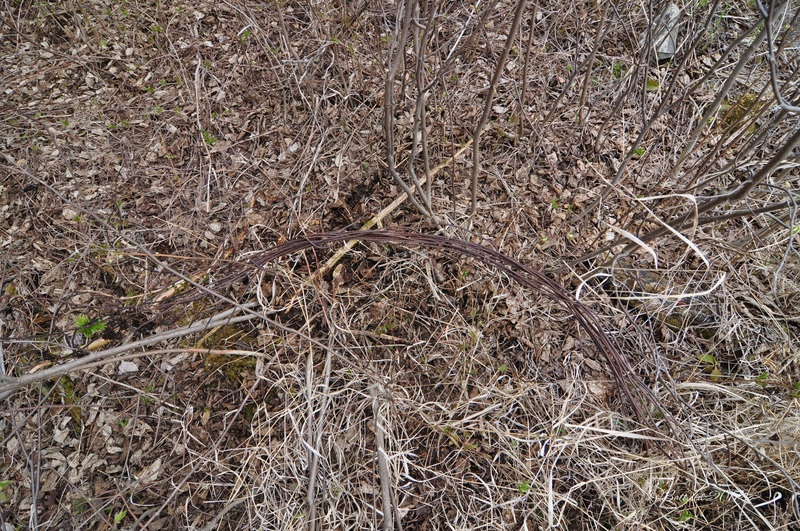 Along the way I uncovered many spikes, a few fishplates and a large coil of wire. That section, for the most part, went pretty smooth, or what passes for smooth in this line of work. Unfortunately, things were going to get way more difficult for the next 2 kilometres I hoped to cover. Spike, Whisker Lake, May 2017. Wire, Whisker Lake, May 2017. 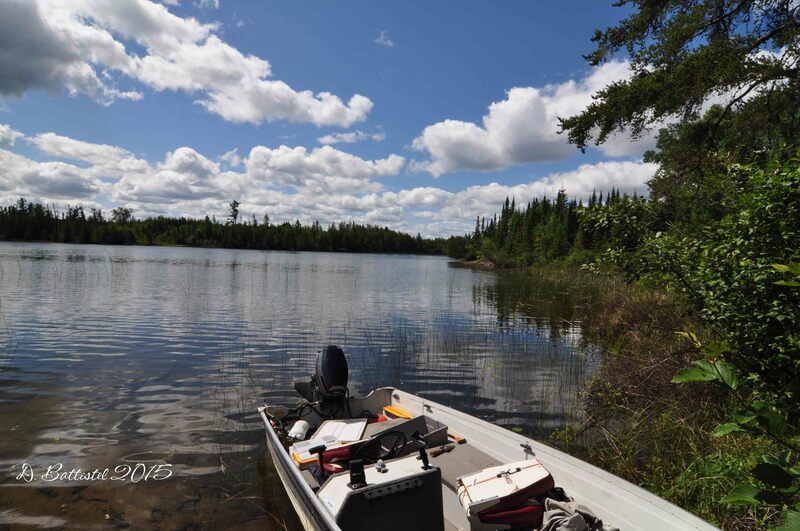 Fishplate, Whisker Lake, May 2017. 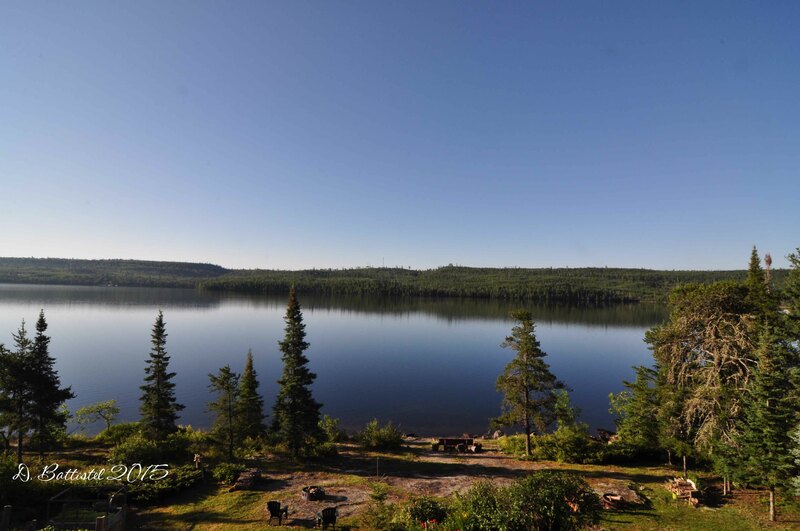 The first 4 kilometres or 2.5 miles of the Gunflint & Lake Superior grade is well pronounced and easy to follow. 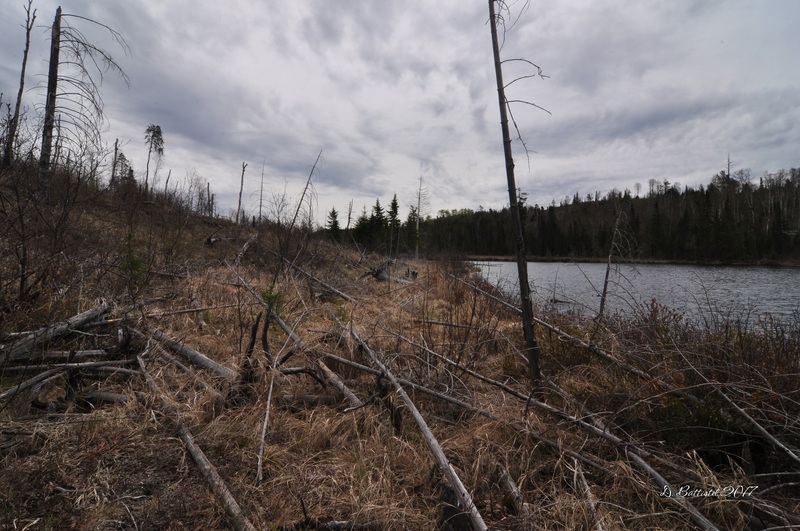 Once it passes the top of the ridge south of Gunflint Lake, things become much less discernible. Using an old and inaccurate 1926 map of Cook County, I theorized that the railroad followed the Crab River south to Crab Lake and then turned eastward. 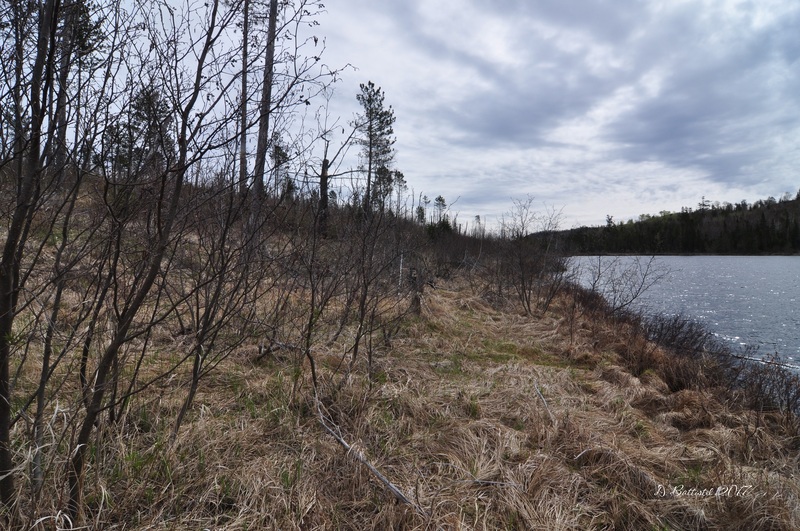 The banks of the river and shore of Crab and Whisker Lakes gave me a reasonable area to work with to locate the grade. However, once past Whisker Lake, things became very dicey. 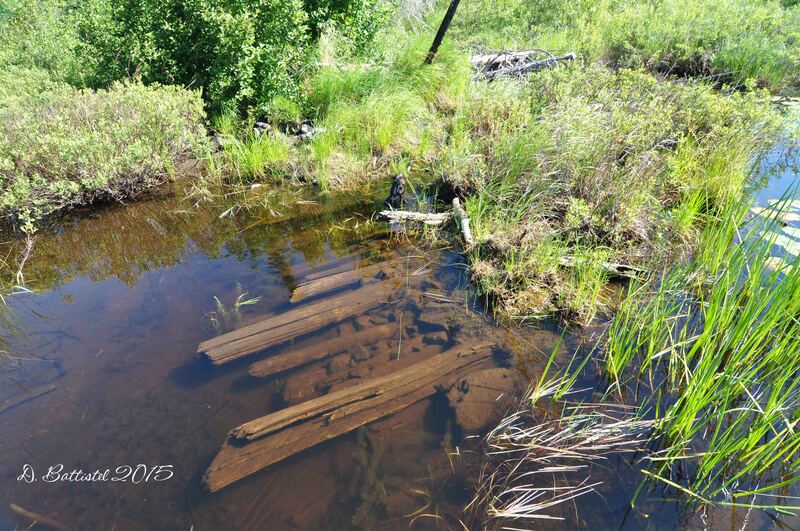 Logging railroads were well-known for their methods of construction, especially given their temporary nature. 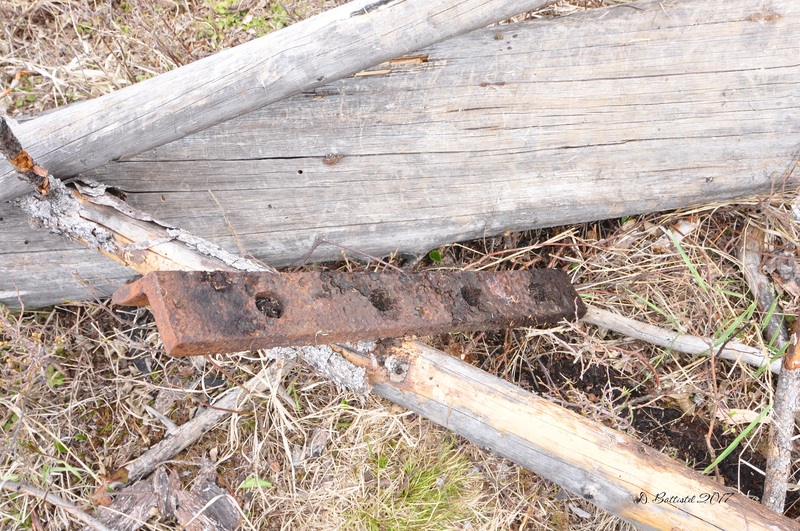 Rails were often thrown down in the most expedient location, with little grading work, since they would be removed once all the timber had been harvested. This is what I had to deal with. Away from the shore of the lake, I had no idea where the railroad went. I was reduced to zigzagging back and forth, hoping for a lucky hit on the metal detector. 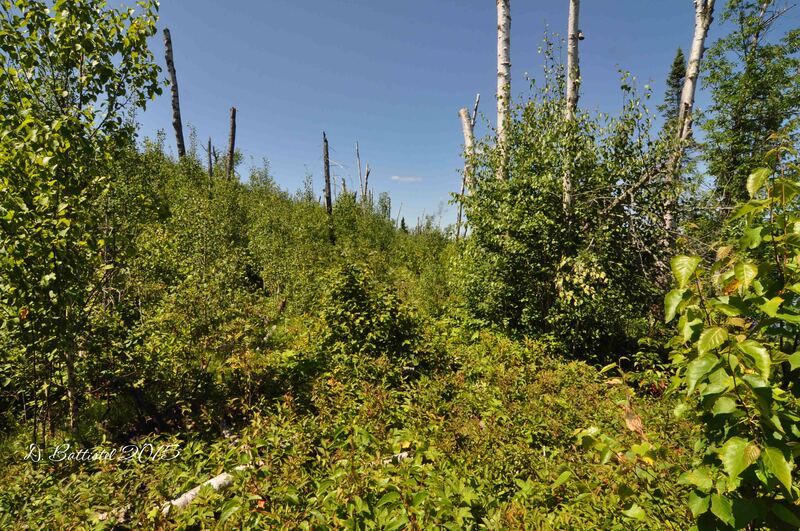 And to make matters worse, the vegetation changed significantly, as I moved away from the area that had been burned by the 2007 Ham Lake Fire. It’s interesting how we (or in this case I), build up an idea of what an area will look like before we get there. I guess in my mind I envisioned towering trees and an easy stroll through the bush. 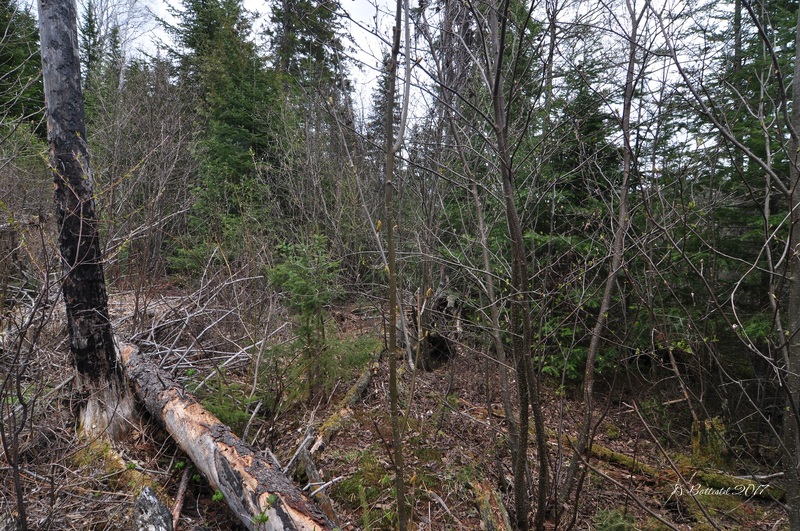 There are two problems with that idea; one, the PRLC cut down all the towering trees, which is why I’m doing all this research. Duh! 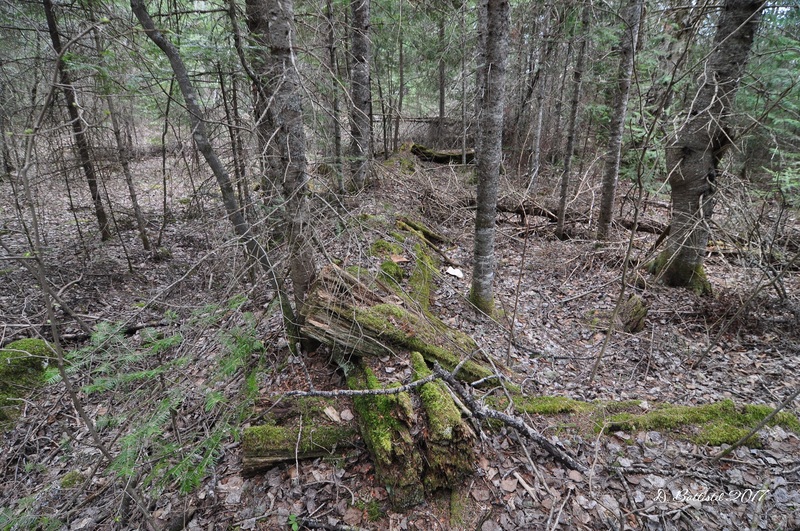 Two, this is the Canadian Shield, and it is messy in the bush. 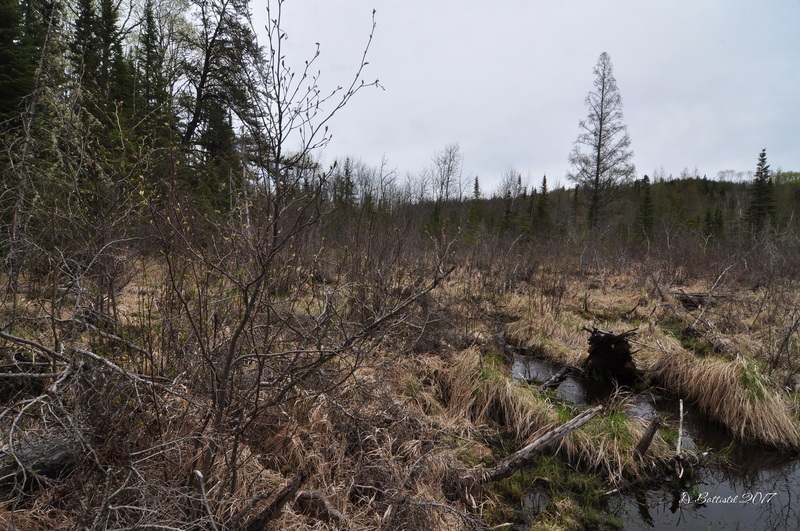 On top of the “messiness” is the fact that I was in an area that is partly swamp, so it can be rather wet and sloppy. So, it was not an easy stroll. As I moved eastward, I found that hits came in batches. I’d walk 80-90 metres and then find some stuff, in this case strands of wire and spikes. Then it was another 100 metres or so before I found a spike and wire, in a spot so grown in that I could barely move. 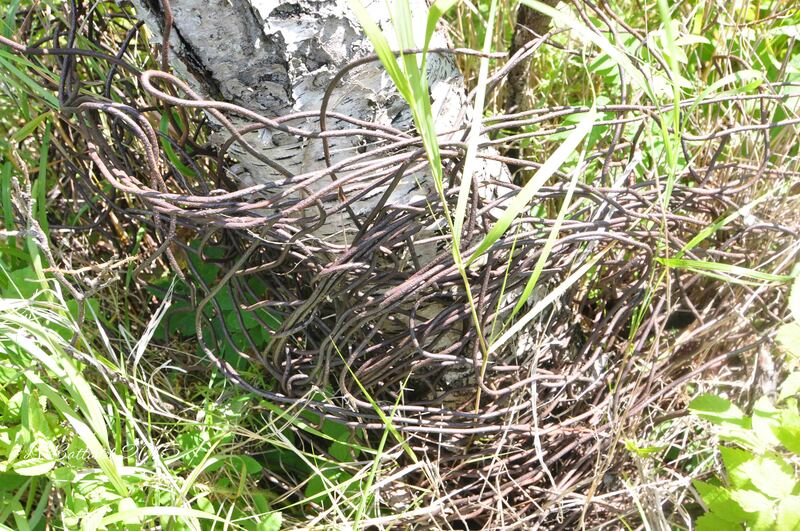 After 250 metres and some thought that I might be lost, I started finding spikes and wire again. This continued for another 450 metres before I completely lost the trail and I guess lost myself. Somehow, I got my bearings messed up and instead of continuing east, I ended up 100 metres south. It took me a bit to get myself pointed in the right direction and back on track. I walked, or rather stumbled on for another kilometre before I pulled the plug on the hike; I had been at it for hours and exhaustion was starting to set in. 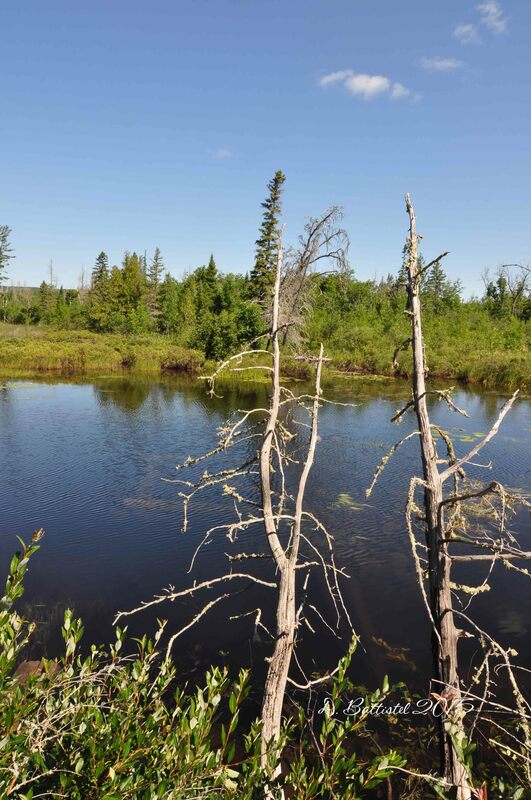 I had gone into the water above my boots early in the hike (a “booter” as we would say where I grew up) and when it happened a second time, in a nasty muck hole, it was the proverbial straw that broke the camels back. Besides, it was getting late and I had a long walk back my truck. By the time I made it back it was 1500 and I had walked some 14 kilometres; I was sore and tired. My physical state was mitigated by the great discovery I made. 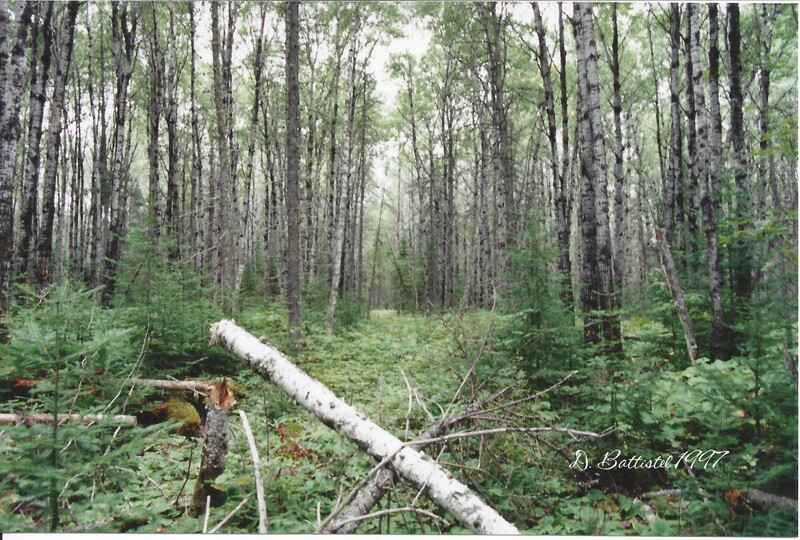 Since last year I had known of the existence of another logging camp, Camp 8, along the Gunflint & Lake Superior. 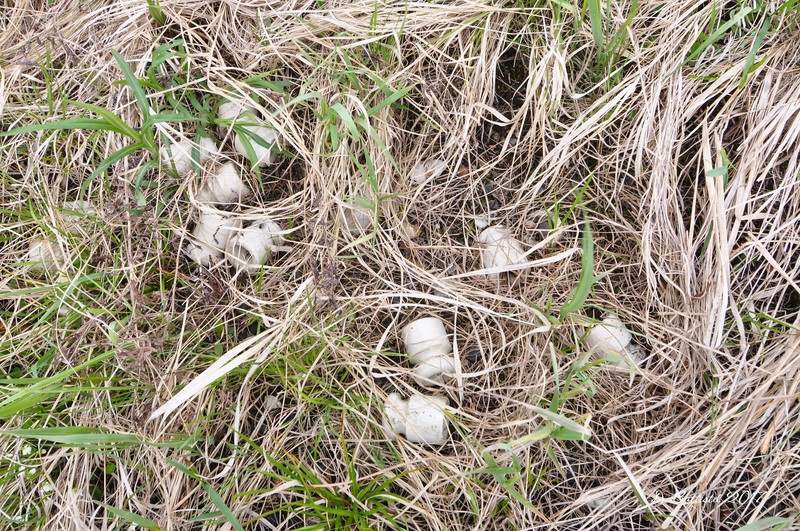 I thought I had located it last year, but I there was this nagging feeling that what I found was not quite right. 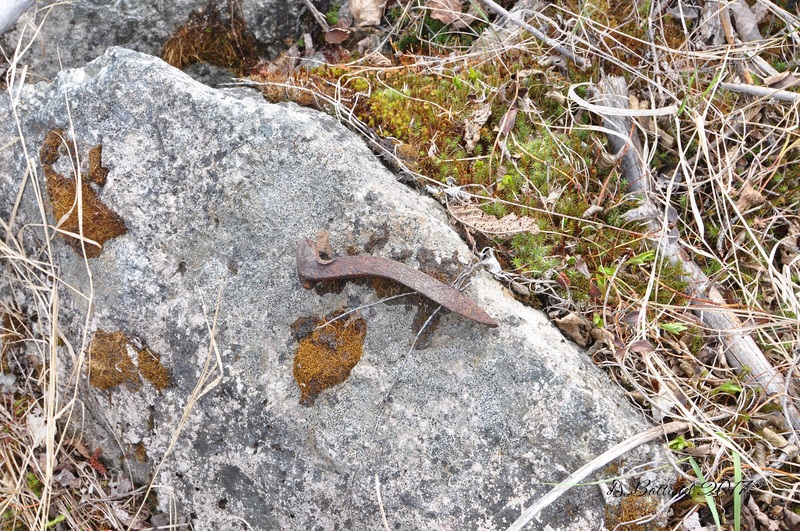 As I was hiking along the railroad, I came across a debris field near the grade that caught my attention. 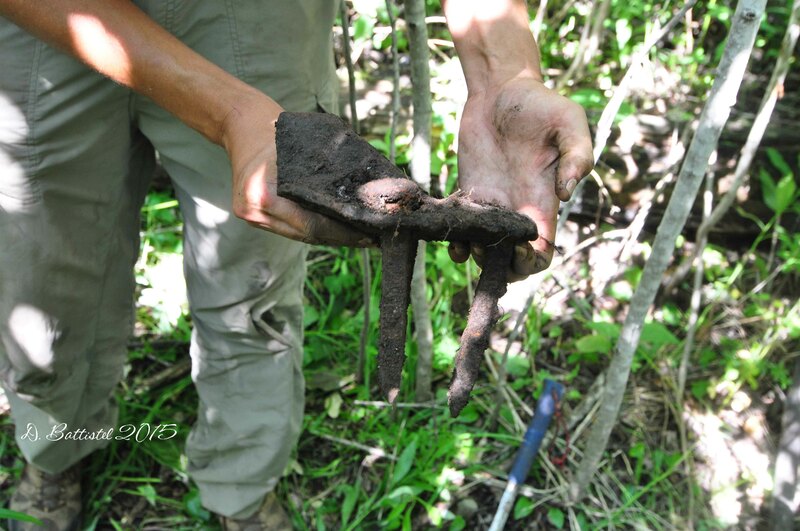 The first things I located were a spike and a fishplate using the metal detector; as I looked around I noticed that there were quite a number of items lying close by. This included a section of pipe, a light gauge rail, buckets, other chunks of metal, coal, slag, ceramic insulators and a snuff jar. 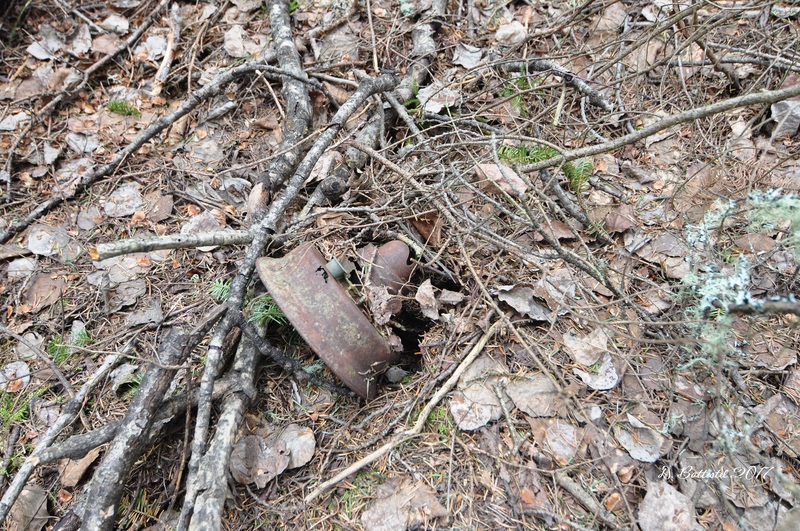 The snuff jar was an interesting find, as the folks from the US Forest Service found the exact same jar at Camp 4 back in 2011. Close to the jar, I found an intact bottle of Davis Vegetable Painkiller, which was first patented by Perry Davis in 1845 (more info here and here). 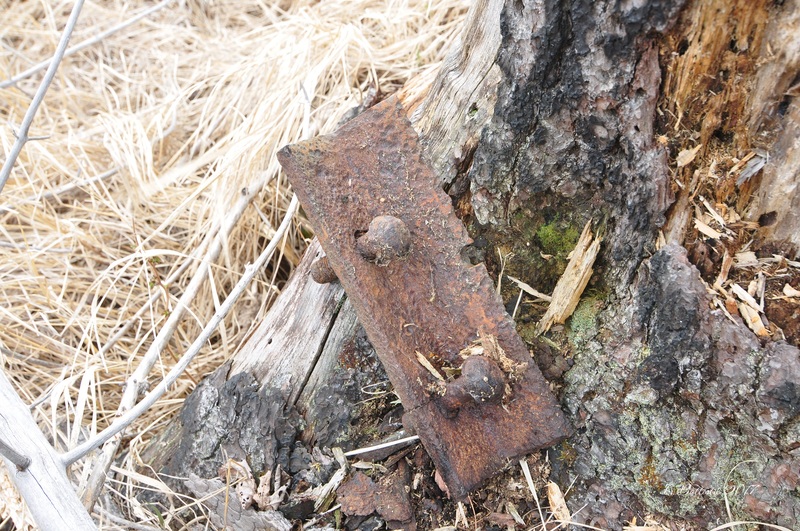 Right beside it was what appeared to be a chunk of metal, but in reality was the blade from a double bit axe. What a cool find! Ceramic insulators, Camp 8?, May 2017. 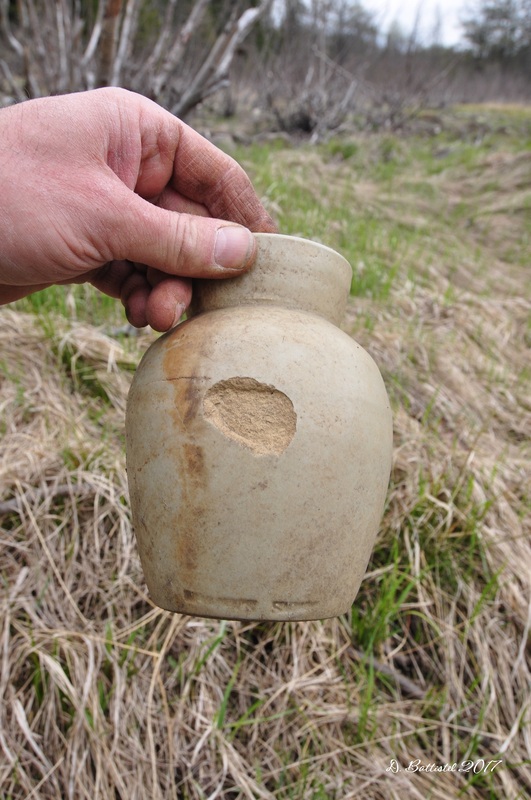 Snuff jar, Camp 8?, May 2017. 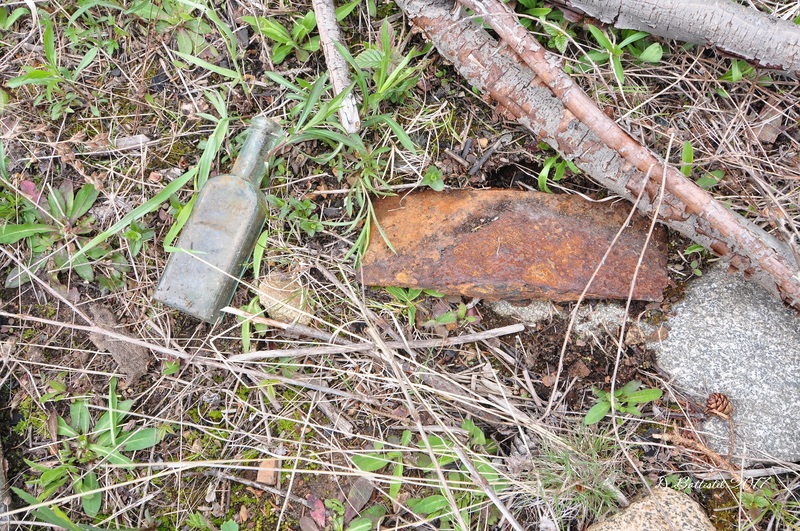 Davis bottle and axe blade, Camp 8?, May 2017. Based on what I found, I knew that these items are not randomly strewn about the railroad; something had to be close by. A short distance away I found another debris field, which included more buckets, wire and cable, a lantern, a shovel, and quite a number of barrel hoops. Then I saw it. 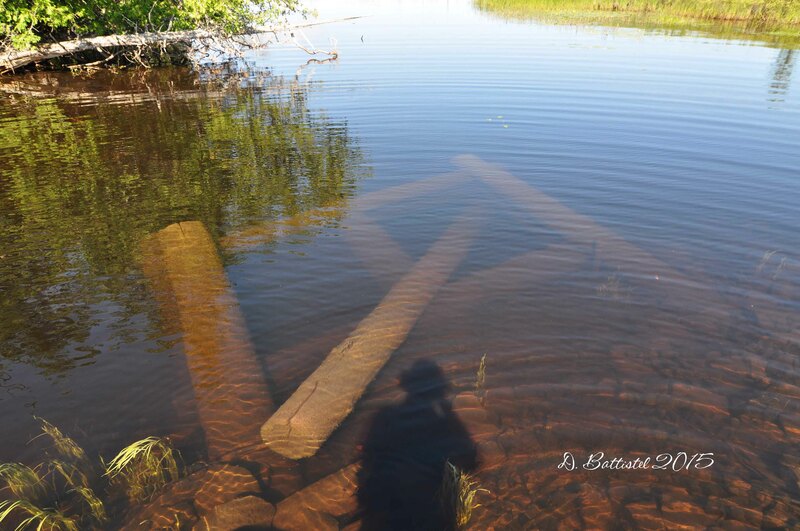 At first my eye was draw to what appeared to be a berm rising up from the ground, then I noticed there was there remains of a log wall sitting on that berm. 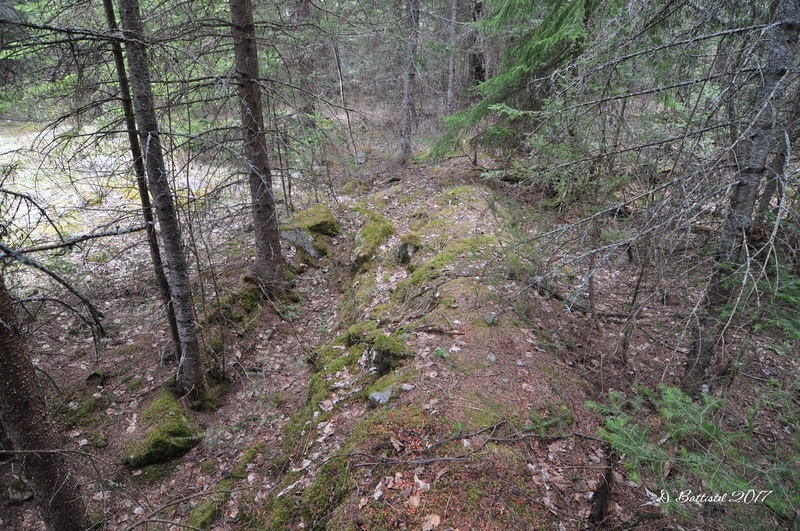 The berm appeared to made of stone, and the northern corners still had logs resting on them. 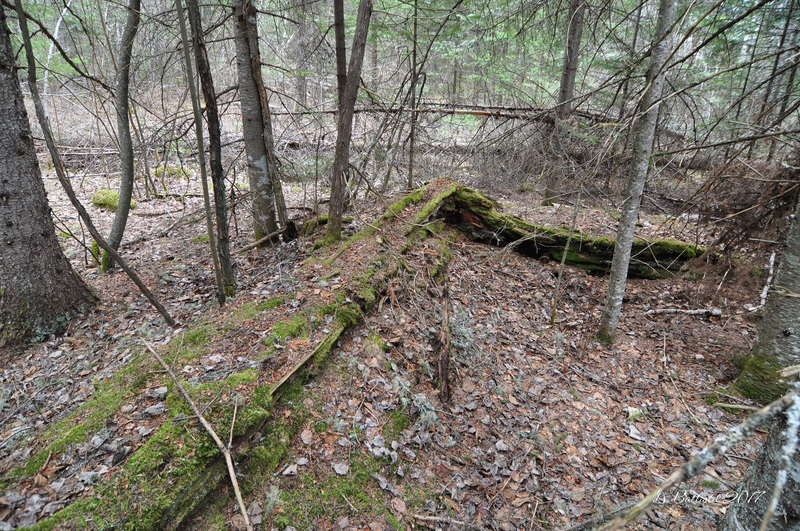 It was a very large structure (I didn’t think to estimate a size) and contained metal and sawn lumber remains within the berms. As I moved around, I located what I believed were the foundations of another two structures, both smaller than the first. 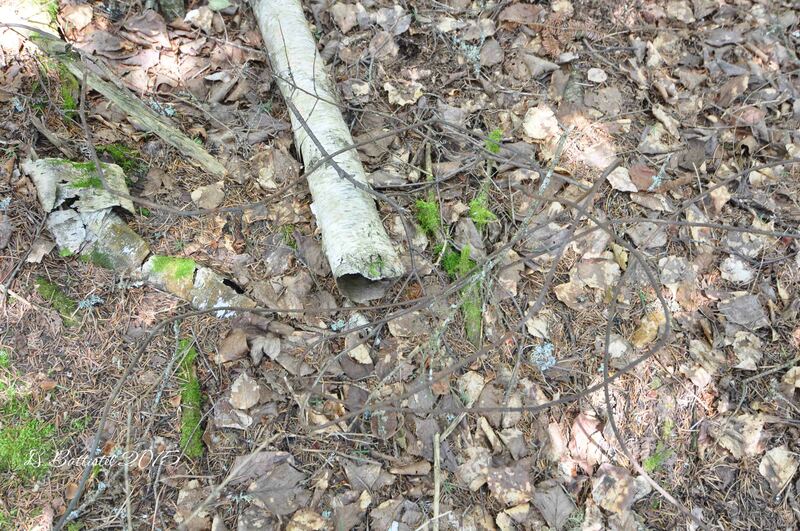 Both had more sawn lumber inside, while one contained sections of what appeared to be stove pipe. 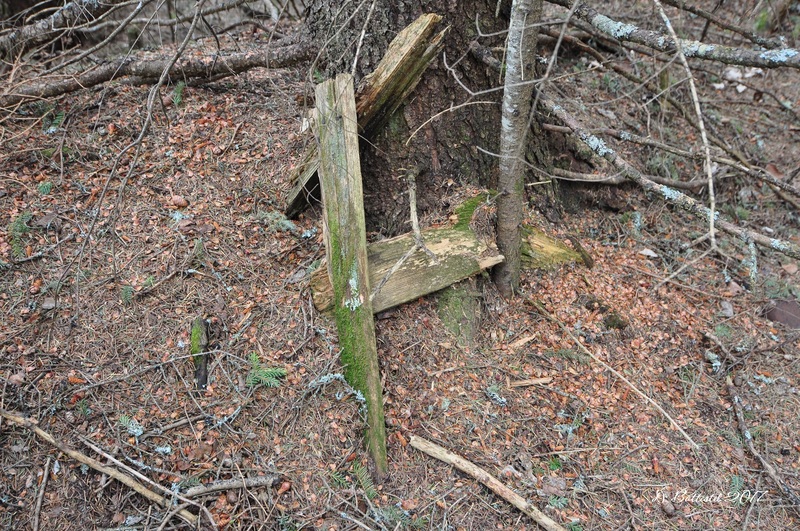 There could be more foundations and more debris in the area, but I did not want to disturb the site and I did not have a lot of time to linger. 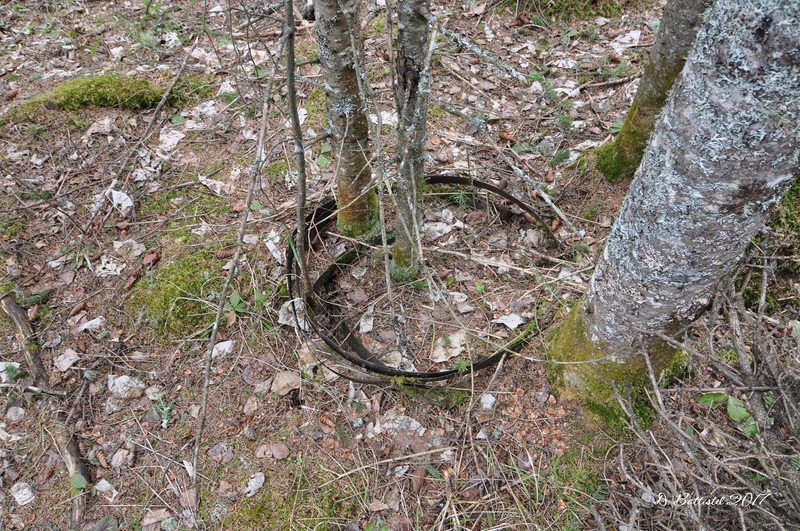 Barrel hoops, Camp 8?, May 2017. Lantern, Camp 8?, May 2017. Building foundation, Camp 8?, May 2017. 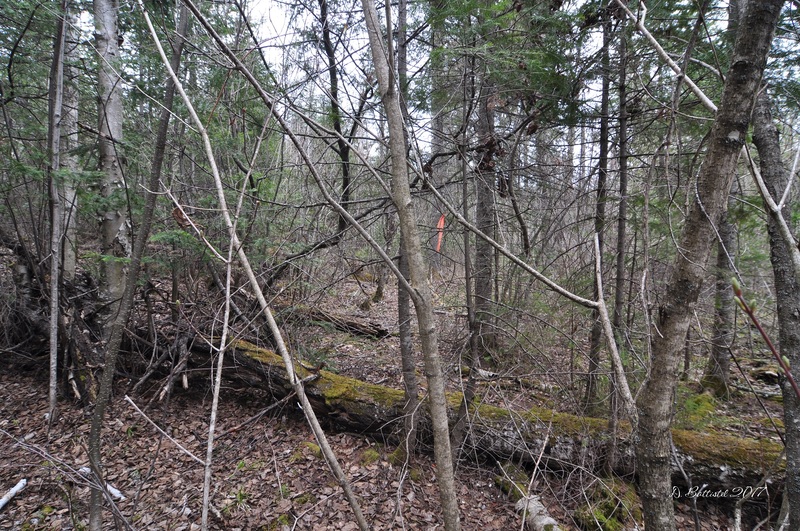 Sawn lumber, Camp 8?, May 2017. As you can tell, I’m being very short on details and coy about its location. While I was there, it was my impression that the site has not seen any visitors in quite some time, I would assume because of its location. It appears relatively undisturbed, which could be a boon to my research (on top of what I already discovered). 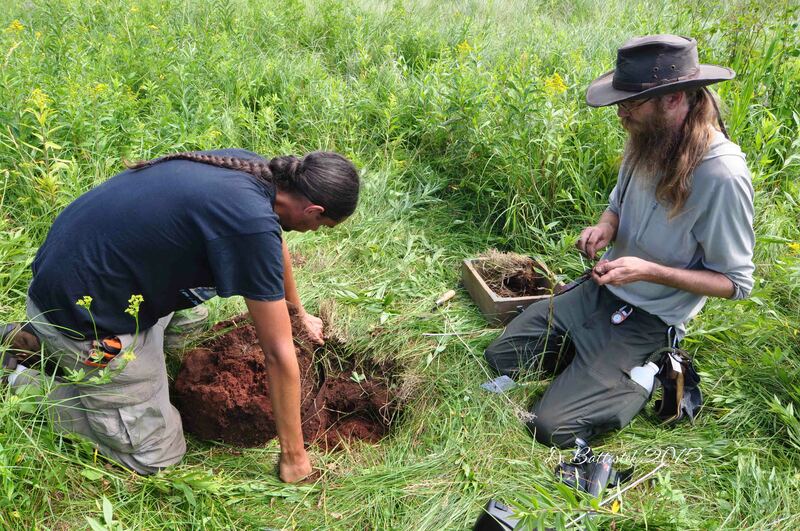 In my discussions with the archaeologists from Superior National Forest, they have no records of this site. 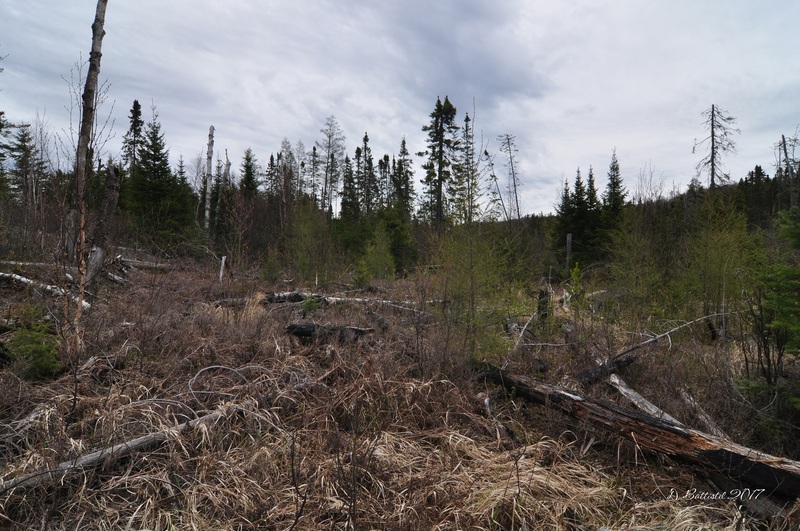 It’s also a rarity, since almost every other logging camp inside the 16,000 square kilometre national forest has long been picked over, including Camp 4. I really hope the Forest Service guys let me tag along when they decide to explore what I hope turns out to be Camp 8.